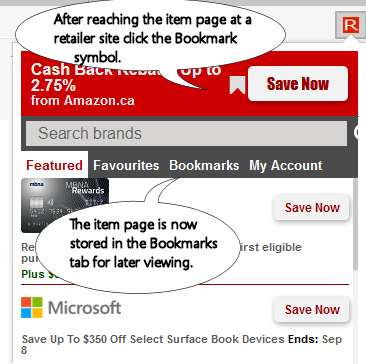 Use GCR bookmarks as a universal wishlist for all retailers. You can also use it instead of holding items in a cart. * Note : The Bookmarks feature is available in Chrome and Firefox. Coming to Safari soon. 1. Visit any retailer found on GCR. Then go to the item page of the item you may purchase later. 3. Click on the item in the Bookmarks tab of the extension when you are ready to purchase. A tracking ID number will be generated and you will collect the rebate. NOTE : Using the bookmark feature does not work if the item you are purchasing is already in the cart at the retailer website or if you use "exclusive" coupon codes. Get the GCR browser add-on and app. Be reminded to use GCR for cash back rebates when visiting a retailer site. See GCR cash back rates in your Google search results. 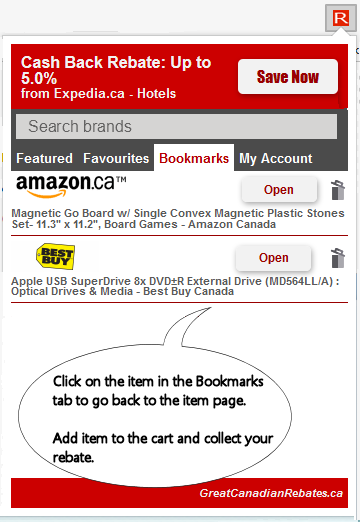 Use the add-on bookmark feature as a universal wish list for all retailers. Mini GCR page with the click of the button on your toolbar. Note: Universal wish list available on Chrome and Firefox. Coming to Safari soon.